It can be a dangerous task bringing previous generation franchises to new consoles. While familiarity can create comfort for gamers, there’s also a risk that a feeling of déjà vu can sink in. When the PS3 hit, two of its platforming heroes took different paths. 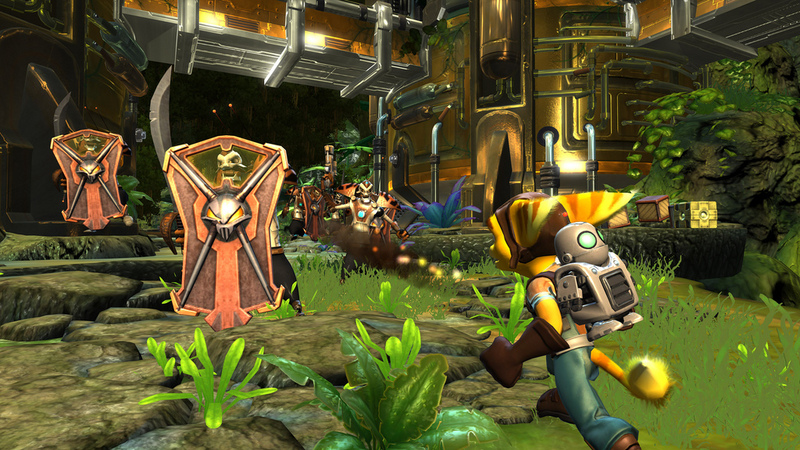 While Naughty Dog abandoned Jak & Daxter in favour of Uncharted and The Last of Us, Insomniac continued to produce Ratchet & Clank games as well as the Resistance trilogy. 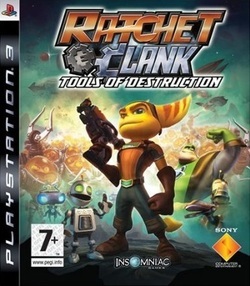 The series made its debut in 2007 with Tools of Destruction, the first part of a trilogy branded ‘Future’. And though it brings a sense of familiarity to the proceedings, it retains many of the series’ strengths. 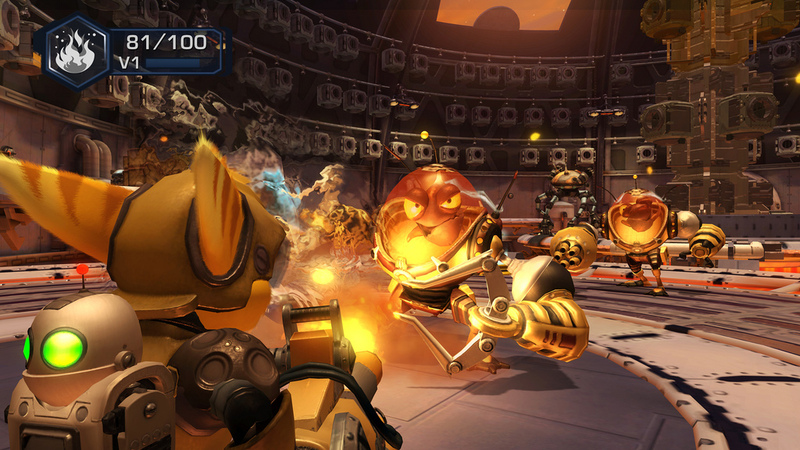 Not usually known for their stories, Ratchet & Clank prides itself on keeping things snappy with humour and its tongue firmly in cheek. Tools of Destruction maintains that, but also attempts to mix it with a deeper origin story, as Ratchet tries to discover his past while dealing with the impending invasion of Emperor Tachyon. The characters are well voiced, and the superbly animated cutscenes are engaging, but the inconsistent tone – swinging between upbeat comedy and serious melodrama – can dampen the story. The cliffhanger ending is a bit of a bummer too. Though Ratchet: Gladiator was a bit of a departure from the mould, Tools of Destruction brings the series back to its planet hopping roots. The opening level serves as a terrific beginning, with an expansive and destructive battle that doesn’t suffer from any slowdown and demonstrates the PS3’s potential compared to its predecessor. It genuinely looks and feels like a battle taken from a Pixar animation. Though later levels don’t quite reach the same height, they’re still plenty expansive and feature some alternate paths for hidden Gold Bolts and challenges. There are plenty of different planets you visit across the 10 hour story campaign, keeping the settings relatively fresh. The key component to every R&C game is its weapons, and Tools doesn’t disappoint. Some are merely adjusted versions of previous weapons, but they truthfully are changed enough to keep them interesting. New weapons include the Mag-Net Launcher which traps foes in an electrifying net, the melee-based Razor Claws and The Shock Ravager, which is essentially Whiplash’s electrically-charged whip. Even more weapons are added through devices, which range from mundane to hilarious. The Groovitron, in particular, is great, allowing you to temporarily stun your enemies by making them dance. When you combine this with the Transmorpher, which turns enemies into Penguins, you’ll be re-creating Happy Feet in no time. The mix of shooting and platforming remains strong, as targeting foes is smooth while jumping and gliding is pure bliss. Insomniac is super experienced, so it’s easy to say they’ve still got it with Tools of Destruction. Where Tools stumbles is with outside elements, which range from fun to dull or broken. Some fun little space-shooter segments acts as bridges between certain worlds, and they present a nice dose of chaotic shooting. Other segments are less successful, particular sections which utilise Sixaxis control. Skydiving, hacking and dancing to unlock pirate doors ask you to shake your controller, and while the latter works well, Skydiving and hacking are incredibly irritating mainly due to the limitations of this function. There certainly is variety, but not all of it hits the mark. 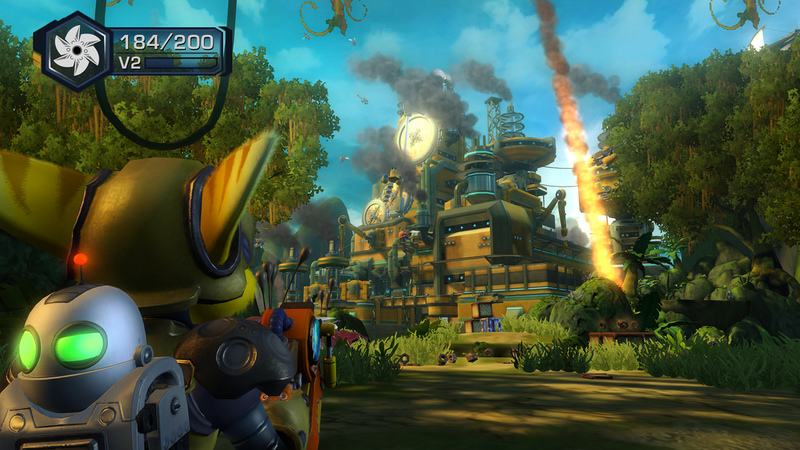 As an early PS3 game, it’s clear that Ratchet & Clank benefited from the boost in tech. As mentioned, levels are huge, but their detail is quite striking too. Little background events, such as flying cars in cityscapes, make each world stand out, despite some linearity. Extra features like improved lighting and no loading times, really take advantage of the console’s hardware. 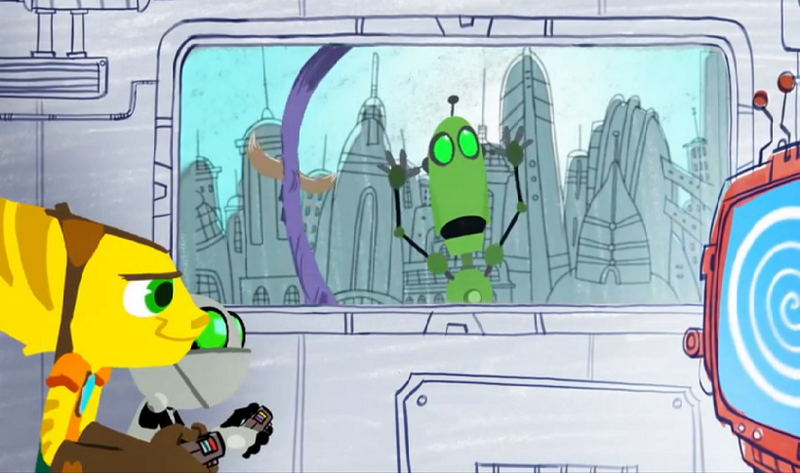 Characters aren’t the most detailed, but their expressive and charming animation during cut-scenes makes it feel like an animated movie come to life. When the action gets heated, with dozen of particle effects and explosions at once, the frame rate never chugs, which is mighty impressive. The audio surprisingly keeps up well too, with decent voice-acting, a fitting score which keeps up with the action and a mix of new and familiar sound effects which instil the R&C identity. Much like previous games, Tools of Destruction manages to pack a fair bit of content despite shunning collectibles for the most part. The lengthy adventure will take you more than 10 hours to finish, and a special new game+ mode unlocks called Challenge Mode. This adds challenge, but allows you to bring your upgraded equipment and creates opportunities to upgrade further through a bolt-multiplier which increases after killing enemies but decreases when you take damage. You can either increase your damage by killing with weapons or purchase other individual mods through Raritanium Crystals, and you won’t be able to fully upgrade on your first playthrough. Special skill points can be earned through challenges to unlock cheats. 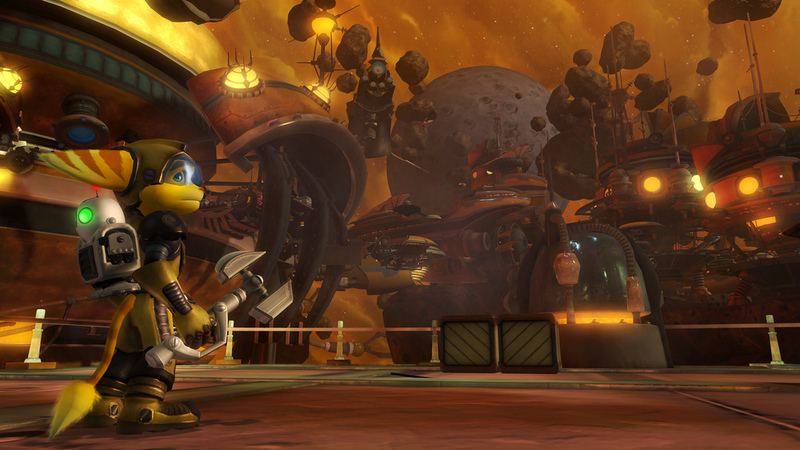 Ratchet & Clank: Tools of Destruction keeps much of its appeal in transition to the next-generation. It thankfully ditches the arena-based combat of Gladiator, and gets back to the planet hopping fun. Shooting and platforming still remain at the core, making for a familiar but fun experience. Some attempts at variety are mixed, but the good outweighs the bad enough to keep the game fun. And with sharp production values, incentives to keep playing and a good sense of humour, Tools of Destruction overcomes its familiar gameplay and weaker story and remain a good time for fans of the series, or platformers in general. Considering how much the genre has died out in the seventh generation, it’s good to see Insomniac keeping the genre going.